The purpose of this magazine has always been to share our vast resources and expertise with our membership. In this issue, we are honored to include articles written by outside writers as well as staff. Noted architectural historian and author James O’Gorman contributed an insightful essay on our forthcoming exhibition, Drawing Toward Home, and conservator Debora Mayer describes the process of treating these fragile drawings so they may safely go on tour. Beverly K. Brandt, professor at Arizona State University, writes about the role of Boston’s Society of Arts and Crafts in furthering aesthetic reform at the turn of the twentieth century. Artist and teacher Ati Gropius Johansen explains adapting Bauhaus educational methods for young audiences. Caroline Craig reminisces about her years cooking for Bertram K. and Nina Fletcher Little. And American furniture expert Kemble Widmer explains how, through physical examination and documentary research, he and fellow connoisseurs were able to pinpoint the origin and history of a much admired but hitherto unidentified eighteenth-century chest. In 2010, Historic New England celebrates its one hundredth year with numerous special public-oriented programs, including being featured at New York’s Winter Antiques Show in January. We will keep you informed on the many ways you can take part in celebrating the region’s rich cultural heritage. Coming Home Except where noted, all historic photographs and ephemera are from Historic New England’s Library and Archives. High Chest. Boston, Massachusetts, 1735–45. Gift of Edmund Quincy. FACING PAGE Walter Crane, frontispiece for Clarence Cook’s The House Beautiful, 1877. ABOVE LEFT Morning room,T. Quincy Browne house, Boston, c. 1882. ABOVE RIGHT Illustration in a Barstow Stove Company catalogue, c. 1886. ABOVE Sitting room, 348 Beacon Street, Boston, 1880s. Allen & Kenway, architects. Soule Art Company photograph. (synonymous with innocence or “sweetness”) or the sunflower (symbolic of “light”). Note the latter in a trade card for art potter Abram French & Co., (contents page). “My Lady’s Chamber” reveals the complexity of the Aesthetic interior as representative of design reform. Drawing in turn from the pre-industrial era, the Far East (and Middle East, in the form of oriental rugs), the vernacular, and nature, it emphasized delicacy and sophistication, a love of the rare, exquisite, and handmade, a quietude and nostalgia bordering upon escapism. My Lady might feel instantly at home in the morning room of the Quincy Browne house at 98 Beacon Street. Altered by architect Herbert Browne for his father c. 1882, the room incorporates recycled architectural antiques, including an elegant neo-classical mantel edged with (possibly blue-and-white) ceramic tile. The Hepplewhite-type armchair closely parallels the one in Crane’s illustration. And the delicate, painted fancy chairs that ring the tea tables are skeletal in the manner of Crane’s Anglo-Japanese example. The cornice, which spans the built-in cabinetry, mantel ledge, and corner cupboard, features an encrustation of ceramics— many Asian—indicative of the porcelain mania from which many aesthetes suffered. Antiques Room at the Jordan Marsh Company, Boston, c. 1926. ABOVE RIGHT Catalogue cover for Daniel Low & Co., Salem, Massachusetts, c. 1927.
decorative patterns; to paraphrase Frank Lloyd Wright, it successfully “eliminates the inessential.” The severity of this Craftsman interior shows the radical progression of design reform from the 1880s to the early 1900s. A period photograph by William T. Clark illustrates a foyer (or possibly a sunroom) from the 1920s that continues in this vein. Both bench and center table show the trestle-end construction seen in the Strathmore advertisement. A chair in the back right corner exhibits the same solid sturdiness of the “Craftsman Look” armchair. Wickerwork and rush seats provide handcrafted texture and an alternative to thick cushions. The floor runner—combining a Greek key motif with Islamic strapwork—resembles rugs purveyed by Gustav Stickley, whose magazine, The Craftsman, marketed the Arts and Crafts movement and design reform to middle-class Americans nationwide. One exotic touch—a glass hanging lantern with enameled floral decoration—provides a vestige of aestheticism. Throughout this room, the interior architecture asserts itself in a forthright fashion. Strong geometry— the grid of the window mullions, tiled floor, angular furniture, trellis that outlines the shallow arch of the ceiling— imposes unity. Browne, c. 1882. ABOVE RIGHT Music room in Arthur Little’s house, 2 Raleigh Street, Boston. ABOVE Studio of Henry Hobson Richardson, Brookline, Massachusetts, c 1885.
reform—remains one mystery surrounding the story of the Arts and Crafts movement in Boston. A room from Arthur Little’s own house at 2 Raleigh Street illustrates a presence from the classical past—namely, the Winged Victory of Samothrace—that was ubiquitous in Boston interiors regardless of their style, so much so that it invited comment by the English author H.G. Wells in his 1906 book, The Future of America. “It is incredible how many people in Boston have selected her for their aesthetic symbol and expression. Always that lady was in evidence about me, unobtrusively persistent.” Her lithe dynamic form, symbolic of triumph and evocative of female beauty, must have appealed to cultured Boston households. Even Henry Hobson Richardson, mentor to many of Boston’s key Arts and Crafts architects whom he trained in his Brookline, Massachusetts, studio, included a photograph of the Winged Victory in his book-lined office. Considered by many to be father of the Arts and Crafts movement in Boston, Richardson blended Morris & Co. textiles with Asian imports, antiques, and objets d’art. The resulting artistic mélange established a precedent in interior décor that many of Richardson’s protégés followed in their own work. This overview of reformed Boston interiors only begins to suggest their richness as a subject for historians. They serve as testimony to two important movements that sought to influence consumers’ surroundings as well as their lifestyles. Boston’s architects created these captivating rooms in consultation with talented artists, skilled craft workers, and cultured clients. Fortunately, the city’s art photographers preserved them for posterity in vivid portraits. Graphic artists also captured their essence in stylized renderings that reveal details and atmosphere that photographs cannot. Taken together, these images document an important aspect of life during Boston’s Gilded Age, when interiors expressed an alternative approach to usefulness and beauty. —Beverly K. Brandt, Professor in the Department of Interior Design at Arizona State University, is the author of the recently published The Craftsman and the Critic: Defining Usefulness and Beauty in Arts and Crafts-Era Boston (University of Massachusetts Press). Mrs. Johansen, daughter of Walter and Ise Gropius, is an artist and teacher. She moved with her parents into the Gropius home in Lincoln, Massachusetts, after its completion in 1938. An Awakened Eye n the 1940s, I attended Black Mountain College, a small liberal arts school in North Carolina known for its excellent art department. I remember well the hot sunny morning when I arrived at the college gates for the summer session. There, on the dirt road ahead of me, was a group of students with shovels, hoes, and rakes, working away and raising a fine cloud of dust. A man in white overalls was earnestly instructing them. I wondered if I had come to the wrong place. As it turned out, I was watching a group of art students and their instructor, the well-known painter Josef Albers, in their art class, grading a road. Albers taught outside the studio quite as much as within, forcing his students to learn new ways of seeing. Solving the problem of shaping the contour of a road for proper drainage is a matter of observation and good design. The new house that Walter Gropius built in 1938 for his family in Lincoln, Massachusetts, looked very different from other houses. Gropius was the founder of the Bauhaus school in Germany, which encouraged artists and designers to use modern materials and think in new and creative ways. the impact the Letâ&#x20AC;&#x2122;s learn about Bauh aus had on our modern world. Walter Gropius is born in Berlin, Germany. Gropius designs the revolutionary glasswalled Fagus Factory. Gropius founds the Bauhaus school in Weimar, Germany. Gropius designs an influential glass-and-concrete building for the Bauhaus School. Is it a stool or a table? Here are several pieces of furniture made with tubular steel designed by Marcel Breuer. A Bauhaus teacher, Breuer went on to become a famous architect and furniture designer. He was inspired to use chromed metal tubes in furniture while riding his bicycle, which was made of the same material. He designed a variety of popular tables and chairs that combined tubular steel with leather, wicker, and wood. The Gropius family found these lightweight pieces very practical and used them as both side tables and stools. The Nazi regime shuts the Bauhaus down. Gropius moves to the United States to teach modern design at Harvard University. Gropius designs and builds a house for his family in Lincoln, Massachusetts. Gropius and seven other architects open an architectural firm, The Architectsâ&#x20AC;&#x2122; Collaborative. Gropius dies at the age of 86. Perspective of a house at Northeast Harbor, Maine, unbuilt, c. 1928â&#x20AC;&#x201C;30. Bigelow, Wadsworth, Hubbard and Smith, architects. major component of the American pursuit of economic crisis may be sought in the failure to properly happiness has long been a home of one’s own finance the dream.) (the automobile is a distant second: the one a The meaning of the American home ranges from refuge castle, the other a chariot). Early on it might to showplace. Frank Lloyd Wright designed hearth-centered have been a four-square neo-classical box or a cozy Gothic houses with sheltering roofs and inconspicuous entry ways, cottage. Of late, for the middle class, it has taken the form of following age-old symbols of domestic security. His a detached single-family dwelling set on a weed-free lawn in Zimmerman House of the 1950s in Manchester, New suburbia, preferably with a two- or three-car garage, Hampshire, is a canonical example. Silas Lapham, in William although town houses, apartments, condos, and seaside or Dean Howells’s 1885 novel, The Rise of Silas Lapham, saw country trophy houses may also qualify. It might be a ranch the dream house rising for his family’s use in Boston’s new house, a Cape, a Colonial, or a McMansion. It might have Back Bay district as proof of his upward mobility. As the cenbeen designed by a “name” architect or a faceless drafter ter of self expression, the home is perhaps the most characworking for a developer. In any case the center of the nuclear teristic building type in a capitalist democratic society. Its family looms large in the popular American psyche. central position in American life makes it an architectural “American Dream Homes,” “American Dream Realty,” design problem worthy of attention. The drawings selected “American Dream Builders,” “American Dream Mortgages”— the Internet abounds with commercial enterprises seeking to help us, at a profit to ABOVE Elevation and plan of the fence and gates for the Henry Clay Frick themselves, to achieve the perfect framework for our Estate, Prides Crossing, Beverly, Massachusetts, 1905 (detail). Little and birthright: domestic bliss. (The origins of the recent Browne, architects. Gift of Herbert W. C. Browne. house, detail of a drawing, 1860. Luther Briggs, Jr., architect. Gift of Elizabeth Huebener. BELOW Plan and elevation of a house for P.D. Wallis, Boston, 1858. Luther Briggs, Jr., architect. Gift of Elizabeth Huebener. Perspective of the cottage of Rev. John Cotton Brooks, Marion, Massachusetts, 1882. John M. Allen, architect. Gift of Christopher Monkhouse. Perspective and plans of a house for Charles F. Harding, c. 1880. Henry M. Francis, architect. RIGHT Perspective of an unidentified suburban residence, 1930s. David J. Abrahams, architect. Gift of Jean S. and Frederic A. Sharf. be told from surviving buildings alone. Some drawings do prescribe what was built and still stands, but some preserve the design of houses now lost, and others record the stages in a design process that ultimately resulted in something different or unexecuted. The student needs both buildings and drawings. 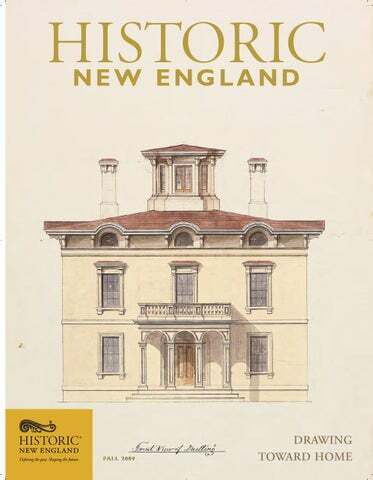 The collection of architectural graphics owned by Historic New England represents a major resource for the study of the region’s history and culture and adds a significant dimension to our understanding of the evolution of the domestic environment in New England, and by extension, of the entire United States. What is shown in this exhibition is the mere tip of the iceberg, a small sampling of an extraordinarily rich and indispensable resource for the fulfillment of the organization’s mission. —James F. O’Gorman, architectural historian and author, is Professor Emeritus at Wellesley College, Wellesley, Massachusetts. Drawing Toward Home: Designs for Domestic Architecture from Historic New England features one hundred original drawings. It opens at the Boston University Stone Gallery on November 18, 2009, and will then travel to the National Building Museum, Washington, D.C. in 2010. James F. O’Gorman served as chief curator with Lorna Condon, Christopher Monkhouse, Roger Reed, and Earle G. Shettleworth, Jr.
Caroline Craig reminisces about cooking at Cogswell’s Grant in Essex, Massachusetts, summer home of Bertram K. and Nina Fletcher Little, during the twenty years that she and her husband, Al, worked there as resident caretakers. FACING PAGE The newly restored garden. THIS PAGE, TOP The terrace before and after restoration, showing how the space has been transformed with new plantings and the reopened staircase, which now offers inviting access to the lower level. BELOW Careful dismantling of the terrace revealed Sleeper's original stairway. Finding the stair meant that Historic New England could preserve it instead of creating a new one based on conjecture. Entry for Andrew Cabot in Nathaniel Gould’s wastebook, 1767–81. Original manuscript from Nathan Dane Papers, Massachusetts Historical Society. BELOW Stereo view of Andrew Cabot’s 1781 house in Beverly, Massachusetts, now Beverly Town Hall. 1860s. Detail of third drawer showing damage, known as a tear-out, which occurred when the drawer front was being planed.The blade caught some irregular wood fibers and tore them out. Normally, Gould could easily have removed the marks by further planing with a finer plane, but the drawer’s swelled bombé shape did not allow it. This article is based on an essay by Kemble Widmer II and Joyce King in American Furniture, edited by Luke Beckerdite and published by the Chipstone Foundation in 2008. Room model by A. H. Davenport and Company, Boston and East Cambridge, Massachusetts, early twentieth century, after treatment. BELOW Drawing of the James A. Noyes house, Cambridge, Massachusetts, 1893–94. 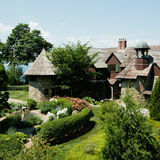 Longfellow, Alden, and Harlow, architects. Shown before and after treatment. onservation planning for Drawing Toward Home began in 2005 when Lorna Condon, curator of Library and Archives, asked me to evaluate the condition and treatment needs of the drawings planned for exhibition. Surveying the one hundred items selected, I found a diverse array— drawings done in graphite, pen and ink, or watercolor. The supports were equally varied — tracing paper, starchcoated fabric, and watercolor paper. Some of the works had suffered damage from poor storage and handling before Historic New England acquired them, including tears and losses, creases and cockles, surface soil, and discoloration from poor quality mountings. My conservation goals were to clean and stabilize the drawings. Each object needed to be exhibitable and strong enough to withstand the rigors of travel. LEFT Sideboard, c.1820. ABOVE Marcia Oakes Woodbury depicted the author’s dining room and the sideboard in one of her illustrations for Jewett’s Deephaven.